Our First Christmas as Mr. and Mrs. your name and a year. 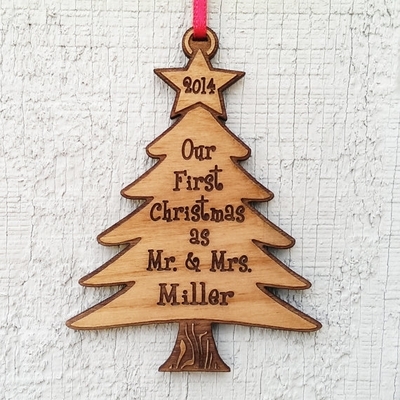 The Christmas ornament is custom made for that perfect, newlywed couple. Beautiful, Eco Friendly and lasting wood. It is about 3 inches tall and comes with a red ribbon for hanging and it is packed in a lovely organza bag, ready for gift giving.